Great service. Employee very thorough and strives to satisfy all requests. I appreciate your positive review and your long term business! I am very pleased with the service I receive. The technicians are always very prompt and very courteous. They answers any questions I may have. They are very respectful of my dogs. I don’t have insects or rodants in the house and that’s great. I thank you for a job well done. Price is very reasonable. Chad was friendly, knowledgeable and on time. All the things we needed. Thank you! I'm a professional Association Manager and I have using the pest control services of Accurate for approximately 18 years. Accurate's friendly, efficient and thorough professionalism from answering the phone to eradicating pests has been consistent through those years. I highly recommend this company for all your pest control needs from insects to rats to possums to raccoons. DHG. Have had Accurite Pest Control for many years now and out of all the ones I ever tried before they are the very best the best customer service in the best to come back and re-spray if needed. Excellent service. Every time. The service men are always professional and courteous. I have been with Accurate Pest Control for a long time and I would recommend them to everyone. They have never disappointed me!!! Every one at Accurate is wonderful. Technician is prompt, professional and conscientious. Excellent service, and a very caring attitude. Always listen to your concerns. Always show up on time. JOHN does a great job. We have been with you around 15 years and he is the most polite and professional technicians you have had. Technicians are always on time and complete their work in a timely fashion. Great folks, Great service! Always on time and do a great job!! The service provided great. The technicians are punctual, thorough and very professional. Always great customer service and competitive pricing. We would not use another company. And Victor is the man Who keeps property pest free! When we moved into our house, there were a lot of scorpions who had taken up residency! Victor cleared them out for us, along with all the other pests. Accurate is professional, efficient, and thorough. I am pleased with customer service and the work they do. Always prompt and professional, no bugs since using their services. Accurate has been great. When I moved in I had rats, pigeons, and of course roaches!They took care of everything and have kept me pest free for over a year. Everyone is courteous and helpful. I highly recommend them! We have used Accurate Pest Control for 15 years. They are always professional and do a wonderful job! We are very pleased with our service from Accurate Pest Control. Our technician Joey is always very professional and prompt! I appreciate your positive comments and business! I have experience with many of the local companies with both my personal property and several rental properties that I manage. Accurate Pest Control is very polite, professional and diligent in solving the problem at hand. I appreciate your positive comments and your business! Very glad to have Victor back. Excellent tech. I appreciate the positive review and loyalty as a customer! Excellent service and very professional plus arrive as scheduled. I appreciate your positive review and loyalty as a customer! I think Chris the technician who serviced my home should always come in the future. He was courteous and did a well job throughout the home inside and out. Please have him service my home in the next appointment. Thank you. I appreciate the positive review and the long term business. I will make sure Chris is your designated technician. I appreciate the positive review. Thank you for your business! Prompt and thorough in solving our rat problem. Always professional and courteous, I definitely recommend them. I appreciate the positive review. I know rodents can be difficult to deal with. We try to rid them of your house ASAP! Thank you for your business! Love this company. Great service and expedient response. Thank goodness the rats and mice are GONE! And the lovely folks at Accurate put plenty of wire in every hole outside...no more unwanted visitors! Great pest control company! Very knowledgeable and they always show up on time. Prices are very reasonable. Personnel are friendly and courteous! Every agent has done a thorough check for bugs, termites, and have done a complete bug free yard!! Cost is very reasonable! the two guys that showed up were very Knowledgeable of thier work. Maricela is always helpful and very nice when I need assistance. When I call for service they are very quick to respond and arrive at my place of business as soon as possible. So far, no bad experiences. 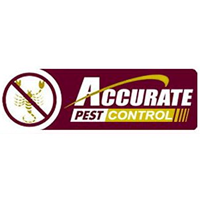 I have been a customer of Accurate Pest Control for over 20 years and they are awesome! Accurate Pest Control has been great! Such friendly, fast service!